Will Rogers is famous for saying "I never met a man I didn't like," and anyone who has ever seen or performed in The Will Rogers Follies will agree: there has never been a man-or woman-who didn't like it. 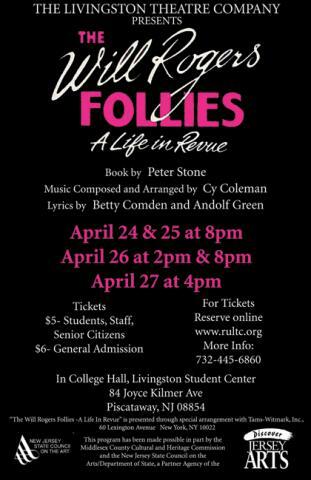 Subtitled "A Life In Revue," ...Follies stands out among musicals because of the magic of its protagonist. Rare is a man who transcends mere decades and rises to the level of legend. Will Rogers is such a man, not only because of his accomplishments, but because of his philosophy, which espouses respect and confidence in the goodness of his fellowman. The curtain rises on a Follies-style tribute to the man whose daily newspaper column sent America on its way each morning with a smile on its face. Will was a multimedia sensation, performing a weekly radio talk show as well as starring in motion pictures. Between rope tricks that entertain the audience while show girls change their costumes for The Follies, Will soothes us with his old-fashioned common sense. Musical numbers include "Will-a-Mania", "It's a Boy", "My Unknown Someone", "Presents for Mrs. Rogers," and "Let's Go Flying".